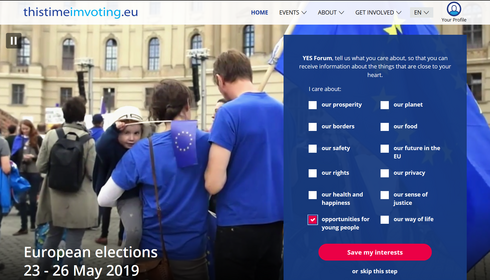 2019 European Elections | YES Forum: Let's act together! That’s how many young people (18-24 years old) actually voted during the last 2014 EU elections. 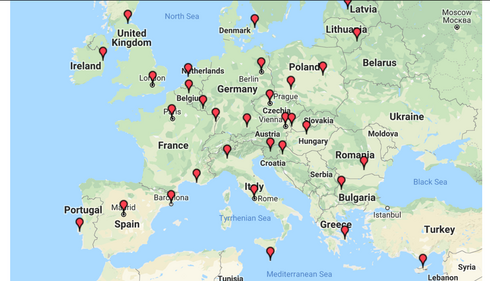 On 23-26 May 2019, new EU Elections will decide who seats in the next European Parliament. A crucial opportunity for the whole YES Forum to have a say … and help improving youth political participation! How? 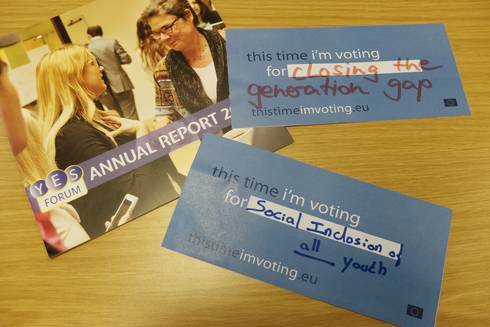 To encourage citizens to vote, the European Parliament launches its new campaign “This Time I´m Voting”. Not a top-down campaign: it relies on citizens and civil society's involvement. The YES Forum Secretariat joined the campaign: Why not YOU? What topics are close to your Heart? 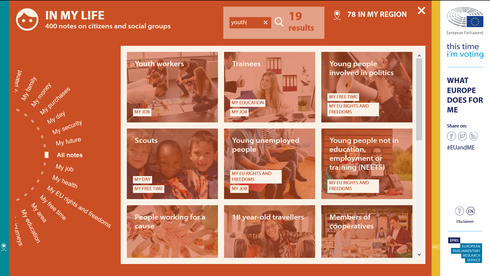 If you join, you will get the latest news about the topics you’re interested in: many are available … including “Opportunities for young people”! The EU breathes beyond Brussels: the campaign allows you to take part in the European life. 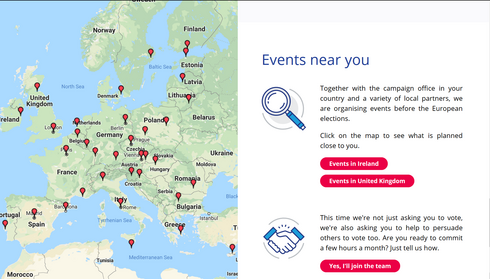 Together with the European Parliament office(s) in your country and local partners, events are organised before the elections. Be active, join the movement and have your say during these events! We have all wondered once: What does Europe? Where is Europe in my daily life? Europe has the answer! 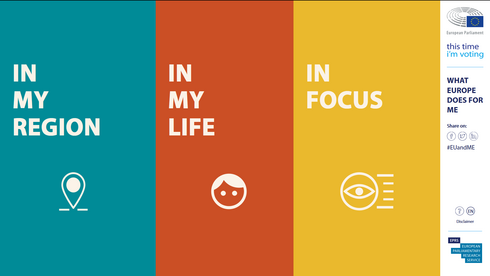 With this new website accompanying #ThisTimeImVoting, you will find all answers about Europe made all the more relevant to you: Discover what the EU does in your region and how it influences many aspects of your daily life (from “Beer lovers” to “Video gamers”!). Joining #ThisTimeImVoting will give you many more concrete perks: specific tools to discuss about the EU with other people, contacts to organise debates with MEPs at home, Social Media visuals to save time on Facebook … Everything that can help you in all 24 EU languages! Get Involved and Join the Team! #ThisTimeImVoting is a community campaign. 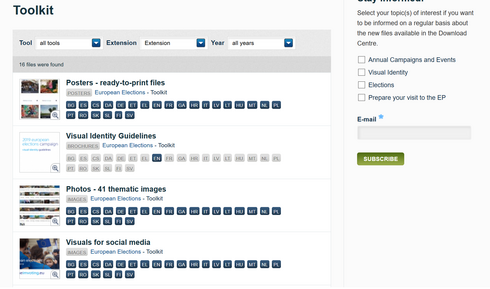 Topics are close to your heart? The EU is important to you? You want it to change? 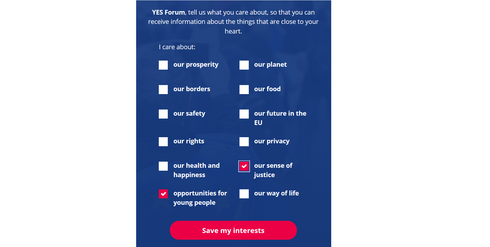 Join YES Forum in the campaign, take part in the adventure, and use these tools to raise awareness about the EU elections towards your own audience!